Founded in 1946 by Walter Medoff, Ace Metal, Inc. continues as a family-owned and operated company. Our long history in manufacturing began and continues with metal fabrication and stampings. We progressed to metal spools and tubular wire carriers that were first designed for use by the John A. Roebling Company of Roebling, NJ. Our in-house tool and die facility works with our customers in the fastener, aeronautics, and automotive industries. Throughout the last 70 years, Ace Metal, Inc. has worked hard to build an excellent reputation manufacturing both custom and standard wire drawing spools for the ferrous, non-ferrous, fiber-optic and tire cord wire industries. 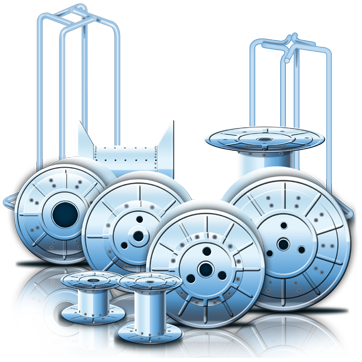 Our spools are designed with uniform quality and precision and are also used in the batch annealing process. Spools are made from prime cold-rolled steel and are available in multiple colored finishes. Ace Metal, Inc. manufactures many varieties of tubular wire carriers—square base, star base, clover leaf base and circular base designs. We design, manufacture and ship our wire carriers throughout North America at economical prices. All of our products are guaranteed for quality, strength and design. It is both a source of pride and pleasure all these years to offer outstanding products to our customers, and we look forward to doing business with you.